Before spinning on a flax wheel, the flax stricks are taken apart and wrapped around a distaff which holds the fiber during the spinning process and keeps them neat and orderly to produce an even thread. In Colonial times, three and four-year-old children in Moravian communities such as Bethlehem, Pennsylvania, were taught how to do such basic skills. 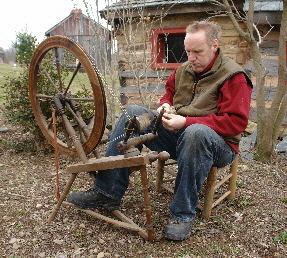 Christian is spinning tow fiber on a Quebec wheel. His French-Canadian great-grandmother spun wool on a similar wheel and knitted it into stockings and mittens as a source of income. These larger wheels are useful for both wool and tow because their larger diameter puts a slower twist in the thread which wool especially needs to prevent over-twisting and becoming brittle. 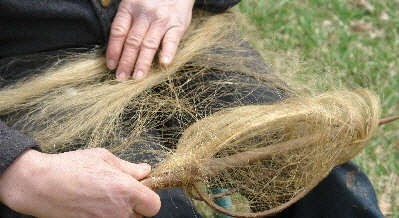 Tow fibers, like wool, are held in the hand and teased to make the thread. Smaller wheels with a faster turning ratio are better for the line fiber of flax because it can be tightly spun to make a very strong thread without breaking. 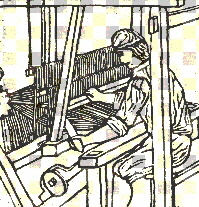 In Europe, linen weaving was typically controlled by trade guilds. Education was by apprenticeship and often lasted seven or more years. The tradition of professionally-trained weavers continued in America among the Germans. However British settlers often maintained a basic, simple type of weaving in the home. 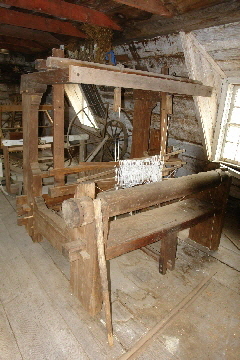 Heavy, large looms like this one were based on European models but built in America for weaving linen and wool separately or in combinations such as linsey-woolsey with its warp of linen and its weft of wool. Other combinations included hemp linen and fustian, a combination of cotton and linen. Today at the Hermitage in central Pennsylvania we raise a half-acre of flax (traditionally enough for two people) and processes it completely by hand. The Hermitage collections of spinning and weaving equipment, tools, textiles, photographs and prints are open to visitors by appointment. 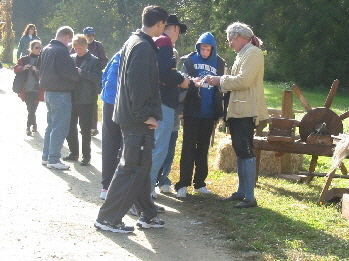 Left, Christian showing visitors the flax process as it was done in George Washington’s time at his Mount Vernon estate.